Ok, I may have exaggerated a little with the title, but man, it should be illegal not to have this little device plugged in to each one of your HD tv’s. Seriously. How did I ever live without it! Google Chromecast turns your boring HD screen into a smart TV that can be controlled from your computer or mobile device. Isn’t that awesome? It’s really affordable (£30 here in the UK, less than half the price of its competitors), discreet (it’s designed to be plugged in to the back of your tv and forgot about it) and stunningly simple to use. The Chromecast folder on my iPhone. How does yours look like? It’s super easy, whether you use an iOS or an Android mobile devices, or a Mac / Windows computer. Buy a Chromecast from Amazon (US | UK), download the Chromecast app (click on the link for the computer version or head to the App Store / Google Play store), plug it into your tv’s HDMI port and follow the on-screen instructions. Boom, you’re all set. The Chromecast icon will show up every time you open an app that work this little magic dongle. You can also cast a Google Chrome tab after you have installed this extension. I love using my iPhone as a remote for my Chromecast. I just launch a Chromecast-compatible app, head to the video or channel I want to watch and send it to my tv. That’s it. As I’m in UK, there are several services I can’t have (HBO Go, Hulu, Pandora, etc.). 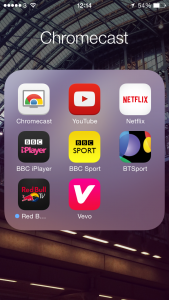 Overall I’m pretty happy with the apps I’m using, especially considering that Netflix is the only one I’m paying for – BT Sport is free for BT customers and offers Premier League, Aviva Rugby Premiership, Serie A, Bundesliga and WTA tournaments to name a few. Spotify has so far chosen not to support Google Chromecast, but that’s not a problem to me. I like listening to the music from my computer with headphones, and if I wanted to cast Spotify with Chromecast I’d just cast a Google Chrome tab running the Spotify Web Player. And as content is not streamed from the device itself but from the cloud, your iPhone battery won’t die after two House Of Cards episodes (that was my main concern at the beginning). How do you use your Chromecast? I’m really looking forward to reading your favourite Chromecast tricks and hacks into the comment section.